April 22, 2015 marks the 65th birthday of rock icon Peter Frampton. Born smack in at the dawn of rock-and-roll’s first decade, Frampton came to dominate it (and all other) popular music just over a quarter-century later. By the mid-1970s, Peter Frampton racked up piles of hits that endure today and blazed a brilliant legacy that touched, and continues to touch, the life and work of artists all over the planet. To celebrate six-and-a-half decades of Peter Frampton rocking among us, let’s look at six-and-a-half highlights from the British innovator’s brilliant career. As for that “half”—well, seeing how Peter stood as a great guest on The Simpsons’ beloved 1996 “Homerpalooza” episode, it’s pretty clear he’s got a killer sense of humor. What’s undeniable is that Frampton’s got a killer sense of absolutely everything when it comes to music. Happy birthday, Peter! We’re saying that to you through our guitar talk-boxes, and we mean it! After attending Bromley Technical School alongside young David Bowie, Peter Frampton bounced around some early bands as a teenager, including the Preachers, an upstart combo managed by Rolling Stone Bill Wyman. The Herd, however, proved to be Frampton’s true point of rock-and-roll entry. Coming on board in 1966 as frontman and lead guitarist at just age 16, glowingly youthful Peter had the looks to drive girls to fainting fits, the chops to command respect from dudes, and sufficient charisma to get the entire planet to take notice. Over the course of scoring three top ten hits in the UK, teen magazine Rave awarded Frampton the coveted title of “The Face of ’68.” Naturally, Peter departed the band shortly thereafter, abandoning the potential bounty that comes with being a bubblegum idol for the hard-and-heavy terrain to be torn up and laid out by his next project, the mighty Humble Pie. Humble Pie stands as one of the definitive supergroups of 1960s and ’70s rock—meaning its one of the definitive supergroups, period. Humble Pie Mach One consists of Peter Frampton trading various guitar and vocal duties the awe-inspiring Steve Marriot of the Small Faces, while they’re pumped up by bassist Greg of Spooky Tooth and seventeen-year-old drumming sensation Jerry Shirley. The group’s free-wheeling-but sophisticated sound arises from hard rock, heavy blues, smoking prog, and wild boogie. When Humble Pie gets cooking, the music often borders on, and occasionally blasts over into, the most intricately impressive realms of early heavy metal. Few perfectly constructed beasts have ever rocked to such an extreme degree of electrifying brilliance. Each early Humble Pie’s is its own treasure: As Safe as Yesterday (1969), Town and Country (1969), Humble Pie (1970), and Rock On (1971). Still, the band built its legend loud, fast, and massively as an unparalleled powerhouse in concert, particularly when they toured America. The 1971 live double album Performance: Rockin’ the Fillmore explosively captures the Pie at the height of their musical command and almost impossible dynamism—led by Peter Frampton’s volcanically fluid guitar. Apparently deciding to go out on that collection of high notes, Frampton parted ways with Humble Pie just as Performance make a deep impact on rock radio and the pop charts. He’d done what he had come to do, then moved on. Frampton’s Camel, conceived to be Peter’s new group, released a self-titled album in 1973 and strengthened his following. It was followed by the definitively solo-minded Somethin’s Happening (1974) and Frampton (1975), with each new release turning up the heat toward inevitable combustion. While still in Humble Pie and for some time afterward as he launched his solo career, Peter Frampton laid his signature guitar mastery on albums and singles by a host of other superstars. Among those icons availing themselves of Frampton’s services were Harry Nilsson (Nilsson Schmilsson), Jerry Lee Lewis (The Session), and the Who’s John Entwistle (Whistle Rhymes). Most significantly, in 1970 Frampton played acoustic guitar on parts of George Harrison’s sprawling post-Beatles masterpiece, All Things Must Pass. It was while recording that landmark that pedal steel guitarist Pete Drake introduced Frampton to a wizardly device called a “talk box.” A few years hence, Frampton would popularly remake the gadget as his own forever after. Rock’s all-time most iconic live album, the four-sided Frampton Comes Alive! landed like a lit powder keg in early 1976. It promptly went to #1 worldwide, outsold all other recordings that year, and, to date, is more than six-times platinum. Beginning to end, Frampton Comes Alive! was—and remains, due in no small part, to its continuing saturation of rock radio—a monster. Frampton Comes Alive!’s content was culled from concerts held at the Winterland in San Francisco, the Long Island Arena, and SUNY Plattsburgh. Frampton’s stripped down but still mammoth-sounding group contains Bob Mayo on rhythm guitar and keyboards, Stanley Sheldon on bass, and John Siomos on drums. What a ruckus that foursome makes! Well into 1977, Peter Frampton rode Frampton Comes Alive! to the highest peaks of rock superstardom. The road ahead would contain some dips and twists, but for one entirely deserved moment, no musician alive could top what Frampton had accomplished. With Frampton Comes Alive! launching Peter Frampton from mere rock star to major pop culture phenomenon, his next steps would be crucial. Much has been made of second-guessing what he did next—including by Frampton himself. 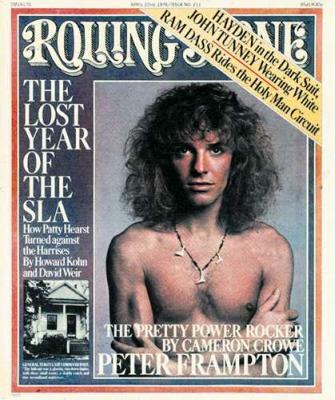 First off, Frampton posed bare-chested for a glamour-shot cover of Rolling Stone, and he says it cost him musical credibility. Then he assembled an A-list team to record his next studio effort. Among the giants appearing on Frampton’s I’m in You are Mick Jagger, Ringo Starr, and Stevie Wonder. That’s the level of peers he was attracting. Sadly, once the glossy, soft-edged I’m in You came out, it was from that height of stardom that he fell—despite the record going platinum and the title track hitting #2. Next, Frampton hopped aboard what looked to be a sure bet. Sgt. Pepper’s Lonely Hearts Club Band, the movie, teamed the world’s biggest solo rock star, Peter Frampton, with the world’s biggest band at the time, the Bee Gees, in an all-star musical adaptation of the Beatles’ most famous album. Alas, the finished film’s wretched quality quickly became legendary, as would its abominable box office returns. Just two years after Frampton Comes Alive! conquered all of existence, Peter Frampton sort of found himself with nowhere to go. Admirably and effectively, he soldiered onward. After flying below the pop culture radar for nearly a decade, Peter Frampton roared back to guitar god credibility at the behest of his old school chum, David Bowie. For his 1987 album, Never Let Me Down, Bowie grew his hair long and sought a return to his rock-and-roll roots. To accomplish this, he put together a tight, peeled-back band, with Frampton leading the charge on guitar. Bowie also aimed to reclaim his title as the king of theatrical rock, and promoted Never Let Me Down with an elaborately mounted traveling stage extravaganza called The Glass Spider Tour, taking its name from a song on the album. Amidst the tour’s massive, mesmerizing visuals and other effects, Peter Frampton’s guitar clearly rang out, reminding the world of his giant talent. Peter Frampton never again came close to the commercial apex of his mid-1970s work, but he also never won a Grammy Award until thirty years past the peak of Frampton Comes Alive! mania. Fingerprints, Frampton’s universally acclaimed 2006 release, ultimately scored the Grammy trophy for Best Pop Instrumental Album. Accompanied by guests that include the Rolling Stones’ Charlie Watts and Bill Wyman along with Soundgarden’s Matt Cameron and Mike McCready, Fingerprints majestically announced that, well into the 21st century, Peter Frampton was very much still coming alive.